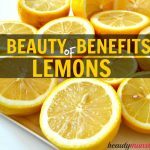 10 Amazing Lemon Benefits for Skin - beautymunsta - free natural beauty hacks and more! 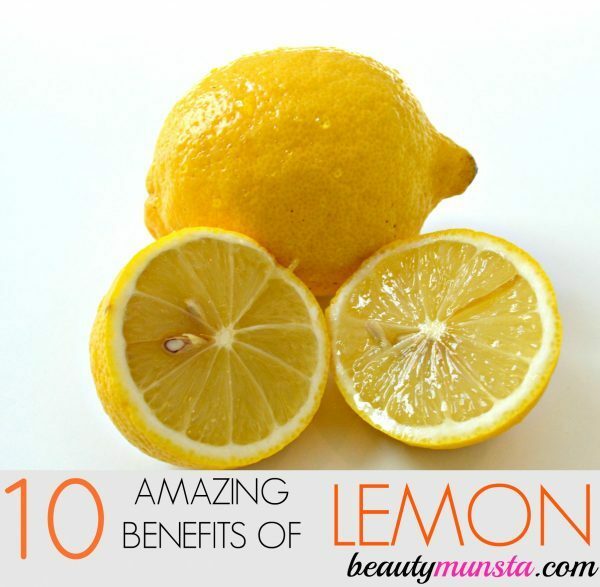 Check out 10 amazing lemon benefits for skin in this article! Blemishes, acne scars, dark spots, pigmentation and discolorations – all these can be safely faded away using the citrus power of lemons. These citrus fruits are incredible skin-healing foods with a laundry list of skin benefits including lightening and brightening dull skin, clearing acne, evening out pigmentation and controlling oily skin. Give your skin a vitamin C boost with lemons! What Makes Lemon so Good for Skin? Citric acid – A type of alpha hydroxy acid, citric acid is a natural astringent which helps shrink large pores and control oily skin. 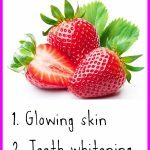 It also evens out skin discolorations and pigmentation. Citric acid also exfoliates skin by sloughing off excess dead cells from the skin’s surface. Vitamin C – Necessary for healthy glowing skin. Vitamin C protects skin cells from free radical damage and slows down the aging process of skin. Magnesium – Magnesium is an important mineral for supple skin. It helps slow down the skin’s aging process and protects skin cells from oxidative stress. Calcium – The top most layer of the skin contains calcium and is necessary for healthy skin. 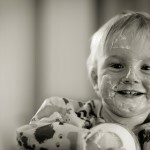 People with calcium deficiency often have dry and itchy skin. If you’re looking for a natural and safe way to make your skin tone a few shades lighter, use freshly squeezed lemon juice for excellent results. Lemon juice has a natural bleaching agent which is most definitely safer than the commercial skin lightening products out there. Lemons are also very rich in citric acid, which is a type of alpha hydroxy acid that has skin lightening properties. Use a ratio of 1 part lemon juice and 1 parts water to create diluted lemon juice. Store this in a clean spray bottle and spritz frequently to see your skin tone lighten a few shades. For fading blemishes, spots and freckles, citric acid is the main miracle at work here. The citric acid in lemons exfoliates skin by breaking down the bind between dead cells. This promotes skin peeling, which accelerates cell renewal and growth making your dark spots, acne scars, freckles disappear! Spritz some diluted lemon juice onto your breakouts to stop them from itching and swelling up. Lemon juice is acidic and has antibacterial properties which can kill off acne germs and bacteria. To make lemon water, combine 1/4 cup of freshly queezed lemon juice with half a cup of water. Store this in a spray bottle and spritz the acne away. Lemon juice checks oily skin and prevents over secretion of sebum out of skin pores. 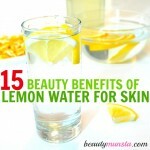 Rub a lemon with honey onto your oily face once a day and rinse off with cool water. Clogged pores often contain excess dead cells which haven’t been exfoliated and get logged inside open pores. Use a simple lemon face mask with brown sugar to scour off excess dead cells and grime from deep within skin pores. 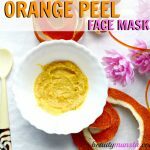 This leaves your skin free from flaky skin as well. Itchy skin can be of two types: one is itchy skin coupled with dryness while the other is itchy acne. I have used diluted lemon juice on inflamed and itchy acne before and it gave me instant results! Just squeeze out the juice of half a lemon in a small bowl. Add in 1 teaspoon of filtered water. Soak a cotton ball in this mixture and dab it on your itchy spots. Citric acid, found in lemon, is a powerful antioxidant which fights off free radical damage and boosts collagen production. Skin can become dull and lifeless when skin cells are constantly attacked by free radicals. Free radicals work by stealing oxygen from healthy skin cells, making them dull and eventually lifeless. Combine fresh lemon juice and yogurt for a multi-vitamin face mask which jolts dull skin cells into action and make your skin vibrant. Skin discolorations and pigmentation can be evened out using lemon juice, which has natural bleaching properties. Dab a cotton pad saturated with diluted lemon juice onto your pigmented areas to lighten them. Keep pesky black heads off your nose and cheeks using an effective blackhead-removing face scrub, using lemon juice and baking soda. Mix 1 teaspoon of baking soda with 1/2 a teaspoon of water. Then add 2 drops of freshly squeezed lemon juice. Rub this onto your nose and other black head infested areas and leave it on for 15 minutes. Rinse off when the time is up. Do this at least once a week. One of the lemon benefits for skin is toning & firming skin as well as tightening large open pores using lemon juice! Lemon is a natural astringent which helps tighten your skin and shrink large skin pores. Coupled with tomato pulp, you can make an ultimate pore-shrinking face mask. Combine 1 teaspoon lemon juice with 2 teaspoons of tomato pulp. Apply this onto your cheeks or whole face. Rinse off after 15 minutes. Your pores will have visibly shrunk! As usual, before you topically use lemons for your skin, use a small test patch and see if its safe for you. If you experience any stinging, itching or burning, then immediately discontinue and rinse off with water and a mild soap. Lemon juice can also make your skin photosensitive which can actually cause discoloration and discomfort. Make sure you rinse off all the lemon juice off your face before sun exposure.